Last updated by Mark Jala at February 7 . Cuisinart MultiClad Pro cookware is excellent stainless steel cookware at a fantastic price. It is near All-Clad quality. Reviewers love Cuisinart MultiClad Pro cookware. 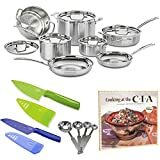 I award this cookware for the best value stainless steel cookware set. With flared rims, solid handles and excellent heat distribution, this is cookware for all levels of cooks, beginner to advanced. I love the Cuisinart MultiClad Pro cookware. I have some and in side-by-side tests with All-Clad, Cuisinart comes in a very close second. However, at the price Cuisinart offers the MultiClad Pro, it is a hands down winner for a stainless steel value. You simply cannot go wrong with this cookware. Be careful though – this is real cookware and the aluminum heats it fast and evenly. One does not have to cook at high temps to get high temp performance. Check out how much reviewers love this cookware below, and then run to get some for yourself. Enjoy! Cuisinart GreenGourmet cookware is PFOA free nonstick eco-friendly cookware. It comes in both stainless steel and hard anodized aluminum versions. While there are many attempting to offer PFOA free nonstick cookware worth their salt, Cuisinart comes through for a lower-priced version. It really is pretty good if one doesn’t expect it to be just as good as the PFOA chemical ridden DuPont variety. The Cuisinart GreenGourmet cookware in stainless steel is fully clad with aluminum for excellent heat distribution. The hard anodized aluminum version doesn’t need to be clad since it is already aluminum. Please note: The above bullet points and the dashboard below are for the stainless steel version. One does have to be a little careful with the Cuisinart GreenGourmet cookware. Does it work well? Absolutely. I’ve had my hard anodized version for a couple years now and it is showing little signs of wear. It does need to be hand-washed and it shouldn’t be used on medium-high to high heat. Most PFOA eco-friendly surfaces in this price range are a bit delicate and will start to stick and flake if not taken care of gently. Exclusive Cuisinart CeramicaÂ® Nonstick Technology - PTFE/PFOA-free and petroleum-free ceramic-based nonstick interior helps to reduce oil consumption and preserve the environment. Healthy Cooking - Cuisinart CeramicaÂ® nonstick surface makes it easy to cook low-fat meals. Versatile Performance - Superior construction is suitable for all stovetops. Induction stovetop compatible. Stay-Cool Eco-Friendly Handles - Riveted stainless stick handles stay cool and are made from 70% recycled stainless steel. Enjoy the Fine Art of Cooking Inspired by the great French kitchens, Cuisinart began making professional cookware almost 30 years ago. Constructed of the finest materials available to perfectly perform all of the classic cooking techniques, Cuisinart cookware continues a long tradition of excellence. Our commitment to quality and innovation continues with our MultiClad Pro Stainless cookware, designed to meet the demands of gourmet chefs everywhere. Unique triple-ply construction joins a brushed stainless steel exterior, a pure aluminum core that provides even heat distribution, and a stainless steel interior, for optimal performance. MultiClad Pro Stainless lets you celebrate the fine art of cooking. What is MultiClad Pro Stainless Cookware? Premium cookware that features professional triple-ply construction - a core of pure aluminum bonded to a stainless steel interior and a brushed stainless exterior - a fusion of the best materials for cooking offering unsurpassed performance. Heat Surround technology maintains even heat distribution along the bottoms and side walls of the cookware, eliminating hotspots. Premium stainless steel cooking surfaces do not react with food or alter natural flavors. Cool Grip riveted handles Tight-fitting stainless steel covers Tapered rims for drip-free pouring The Cuisinart Details Designed to provide professional gourmet cooking results, this collection offers perfect heat and perfect results, every time. The Choice of Professionals Aluminum core heats and cools quickly for precise temperature control. Heat Surround technology provides even heat distribution along the bottom and up the side walls of the cookware. Stainless steel interior is ideal for delicately simmering sauces. Perfectly sautéing vegetables, browning meats, or boiling several servings of pasta. Covers Seal in Nutrients Tight-fitting stainless steel covers seal in food's natural juices and nutrients for healthier, more flavorful results. Covers are dishwasher-safe. Drip-Free Pouring Rims are tapered for drip-free pouring. Professional Results Stainless steel cooking surface does not react with food or alter food flavors. Great for classic cooking techniques like sautéing, frying, browning, searing and slowly simmering delicious sauces. Superior Heat Triple-Ply construction includes the unsurpassed heat conductivity of a pure aluminum core. It insures maximum heat retention and even heat distribution, eliminating hot spots. Perfect Balance Exclusive Cool Grip handles stay cool on the stovetop. Handles with unique thumb rests are riveted for perfect balance and ultimate control when lifting and pouring. Triple-Ply Construction Brushed stainless steel exterior, pure aluminum core for even heat distribution, and a stainless steel interior. Why make our best your best? The MultiClad Pro Stainless Cookware Collection is designed to meet the culinary needs of the most demanding gourmet chefs. Its triple-ply construction facilitates effortless cooking and first-class results, enabling even the kitchen novice to whip up meals with a gourmet flair that will delight the whole family. Whether a menu calls for sautéed pork medallions, a slow-cooked Manhattan chowder, or spicy sun-dried tomato sauce that simmers all day long, Cuisinart MultiClad Pro Stainless Cookware makes cooking it a joyful experience. Discover the gourmet chef in you, and get ready to cook your best. Enjoy the Fine Art of Cooking Cool Grip riveted handles Inspired by the great French kitchens, Cuisinart began making professional cookware almost 30 years ago. Constructed of the finest materials available to perfectly perform all of the classic cooking techniques, Cuisinart cookware continues a long tradition of excellence. Our commitment to quality and innovation continues with our MultiClad Pro Stainless cookware, designed to meet the demands of gourmet chefs everywhere. Unique triple-ply construction joins a brushed stainless steel exterior, a pure aluminum core that provides even heat distribution, and a stainless steel interior, for optimal performance. MultiClad Pro Stainless lets you celebrate the fine art of cooking. What is MultiClad Pro Stainless Cookware? Premium cookware that features professional triple-ply construction - a core of pure aluminum bonded to a stainless steel interior and a brushed stainless exterior - a fusion of the best materials for cooking offering unsurpassed performance. Tight-fitting stainless steel covers Heat Surround technology maintains even heat distribution along the bottoms and side walls of the cookware, eliminating hotspots. Premium stainless steel cooking surfaces do not react with food or alter natural flavors. The Cuisinart DetailsDesigned to provide professional gourmet cooking results, this collection offers perfect heat and perfect results, every time. The Choice of Professionals Aluminum core heats and cools quickly for precise temperature control. Heat Surround technology provides even heat distribution along the bottom and up the side walls of the cookware. Stainless steel interior is ideal for delicately simmering sauces. Perfectly sautéing vegetables, browning meats, or boiling several servings of pasta. Tapered rims for drip-free pouring Covers Seal in Nutrients Tight-fitting stainless steel covers seal in food's natural juices and nutrients for healthier, more flavorful results. Covers are dishwasher-safe. Drip-Free Pouring Rims are tapered for drip-free pouring. Professional Results Stainless steel cooking surface does not react with food or alter food flavors. Great for classic cooking techniques like sautéing, frying, browning, searing and slowly simmering delicious sauces. Superior Heat Triple-Ply construction includes the unsurpassed heat conductivity of a pure aluminum core. It insures maximum heat retention and even heat distribution, eliminating hot spots. Perfect Balance Exclusive Cool Grip handles stay cool on the stovetop. Handles with unique thumb rests are riveted for perfect balance and ultimate control when lifting and pouring. Triple-Ply Construction Brushed stainless steel exteriorPure Aluminum Core for even heat distributionStainless steel interior Why make our best your best?The MultiClad Pro Stainless Cookware Collection is designed to meet the culinary needs of the most demanding gourmet chefs. Its triple-ply construction facilitates effortless cooking and first-class results, enabling even the kitchen novice to whip up meals with a gourmet flair that will delight the whole family. Whether a menu calls for sautéed pork medallions, a slow-cooked Manhattan chowder, or spicy sun-dried tomato sauce that simmers all day long, Cuisinart MultiClad Pro Stainless Cookware makes cooking it a joyful experience. Discover the gourmet chef in you, and get ready to cook your best.